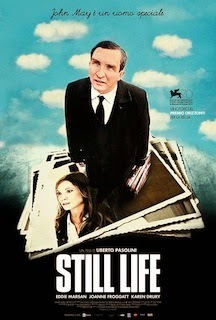 Movie Review: “Still Life” works as a poignant drama and black comedy, consisting in the sophomore feature film from Italian-born, British-based director, writer, producer, and former investment banker, Uberto Pasolini. The story focuses on John May, magnificently performed by Eddie Marsan, a council caseworker who tries to find the absent relatives of recently deceased lonely people, trying to persuade them to attend the funeral. Oftentimes, John is the unique presence in those funerals and that certainly makes him feel terrible and frustrated. Although very tidy, obsessive, and meticulous in his work, John receives order to leave the premises for good due to department reorganization, after 22 years in service. But not without finishing his last case concerning Billy Stoke, an isolated man with a violent past, who lost contact with his daughter that no one knew about. To satisfy his own curiosity, John starts gathering the maximum info by meeting Stoke’s relatives and acquaintances in person. Marsan was simply brilliant; his presence and expressions (like when he was absorbed in old photo albums) stick to our heads for a long time after the film is over. After all, the morbid yet good-hearted John himself, is also looking for a meaning in his solitary life. “Still Life” is a grey, gloomy, and fatalist film in every sense, but nonetheless rewards us deeply in the end. With four distinguished prizes at Venice, Pasolini, with a classy direction, seems condemned to a big career.